A small village retreat with spectacular views and hikes! We absolutely loved staying in Marjan&rsquo;s home and exploring the beautiful countryside. We had authentic snacks, beer and wine at both local taverns for the true Gornje Sitno experience, and even played Bocci with the local residents! The region is absolutely gorgeous with breath-taking views of the ocean and the city of Split and Trogir in the distance. The neighbourhood has numerous hiking trails out the back door which are well laid-out and easy to find. 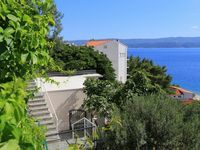 If you want to be absorbed by nature and be away from the crowds, we absolutely recommend this accommodation &ndash; plus it is only a short drive to get to Split for a day visit. Make sure you arrive with all the supplies that you need because you will not want to leave! 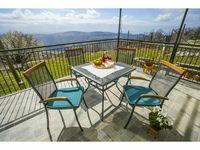 Marjan&rsquo;s home is a wonderful 2 bedroom house with a nice kitchen and roomy living-room that extends out onto a beautiful balcony with views of the countryside that are awesome. The house is very clean, well equipped with everything you need, including a parking spot and air conditioning. The bathroom is a good size with nice hot running water shower/tub combo. We found that we could get a great breeze running through the house with windows open &ndash; fresh country air! This stay was our first stay in Croatia and undoubtably will be one of our favorites. Marjan was the best host that one could possibly have. He answered our inquiries instantly, and consistently responded immediately. We would not hesitate to come back and stay at Marjan&rsquo;s home, it was truly a unique Croatian experience, filled with local culture and picturesque countryside. Thanks Marjan &ndash; hope to see you again soon.